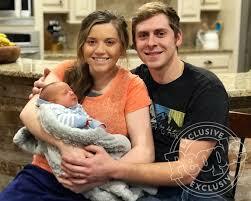 Growing up with 18 siblings of her own, Joy-Anna (Duggar) Forsyth had lots of firsthand experience caring for children. But when she welcomed her baby boy earlier this year, the new mom realized that some things can only be learned through parenting. “I have to wake Gideon up at least twice a night to feed him to make sure that he’s gaining weight because he’ll just sleep and won’t eat,” Joy-Anna, 20, says in a PEOPLE exclusive sneak peek at Monday’s Counting On episode. On Feb. 23, Joy-Anna gave birth to her baby boy, Gideon, who measured 22 inches long and weighed 10 lbs., 3 oz. After bringing little Gideon home, new dad Austin Forsyth also learned about the hardships, fears and realities of raising a newborn. As the couple approached the birth, Joy-Anna and Austin anticipated that she w would be having a home birth. But after being in labor for over 20 hours at home, Joy-Anna’s midwife determined that the baby was breech, and she was rushed to the hospital, where she learned that she needed an emergency C-section. “I hadn’t really ever changed a diaper before we had Gideon,” Austin admits. “And then with Joy’s C-section and her being kind of bed-ridden, just not really being able to get out of bed much, she probably changed maybe five diapers the first two weeks. So like diaper bootcamp. I got broke in,” he says with a smile. As Austin tirelessly cared for his wife and newborn son, it certainly didn’t go unnoticed by Joy-Anna.